In a previous post, we took a look at some of the resources available at the Stephen A. Schwarzman Building of the New York Public Library (NYPL). There are three other research libraries within NYPL, each offering an impressive depth of subject matter and scope. The Schomburg Center for Research in Black Culture. Photo credit: © New York Public Library. 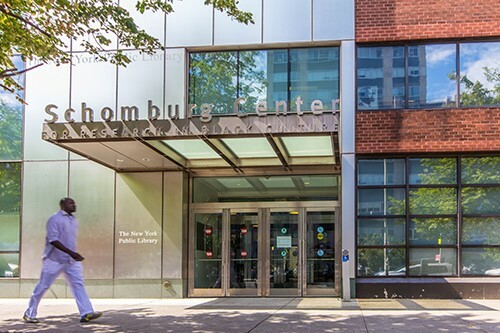 The Schomburg Center for Research in Black Culture, located in Upper Manhattan, focuses on “African American, African Diaspora, and African experiences,” with expansive collections of over 11 million items. There are five divisions, providing access to motion picture films, newspapers, periodicals, photographs, prints, recorded music discs, sheet music, and more. The Jean Blackwell Hutson Research and Reference Division offers support in navigating these resources, as do the subject-specific research guides on topics such as: Independent Black Bookstores, Nelson Mandela, and Black Feminism. Right around the corner from the Graduate Center Library, with an entrance on Madison Avenue between 34th and 35th Streets, you will find the Science, Industry, and Business Library (SIBL). At this NYPL location, you can sign up for free consultations on legal and financial aspects of business ownership, career coaching, and industry research. They also offer Small Group Meeting Rooms, which can be reserved in advance through this form. Rooms can accommodate between 2-6 people, with one larger room for up to 10 people. 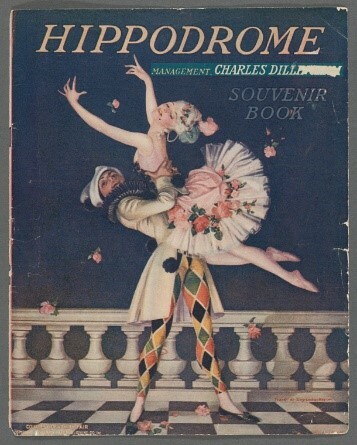 Image credit: “Box 10 Folder 11, from The New York Public Library, Billy Rose Theater Division” is in the Public Domain. If your research interests have a theatrical flair, try the New York Public Library for the Performing Arts. Holdings include (but are not limited to) musical works, screenplays, history/biography in the field of dance, a song index, and an Orchestra Collection. The circulating collections approach each subject with a broad lens – for example, the section on dance includes the related fields of anatomy, kinesiology, fencing, mime, and synchronized swimming. Throughout the year, there is a robust series of public programming at the Bruno Walter Auditorium – live music, visiting international festivals, and masterclasses by notable figures in the world of performing arts. For more on these subject areas, try the following Research Guides from the Graduate Center Library: Africana Studies, Theatre and Performance, Music. Often, as in the case with the database Black Drama, the Graduate Center Library may subscribe to a resource not held by NYPL, or vice versa. The above guides feature several relevant resources (provided by the GC, CUNY, NYPL and more) to get you started on your research path.